Garrett Neese/Daily Mining Gazette From left, Republican State House of Representatives candidates Keith LaCosse, Greg Markkanen, Kirk Schott and Brady Tervo participated in a forum held at Dee Stadium Monday night. 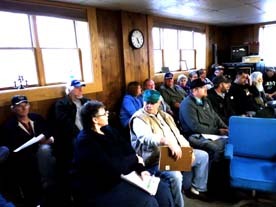 The event was hosted by the Keweenaw County Republican Party. 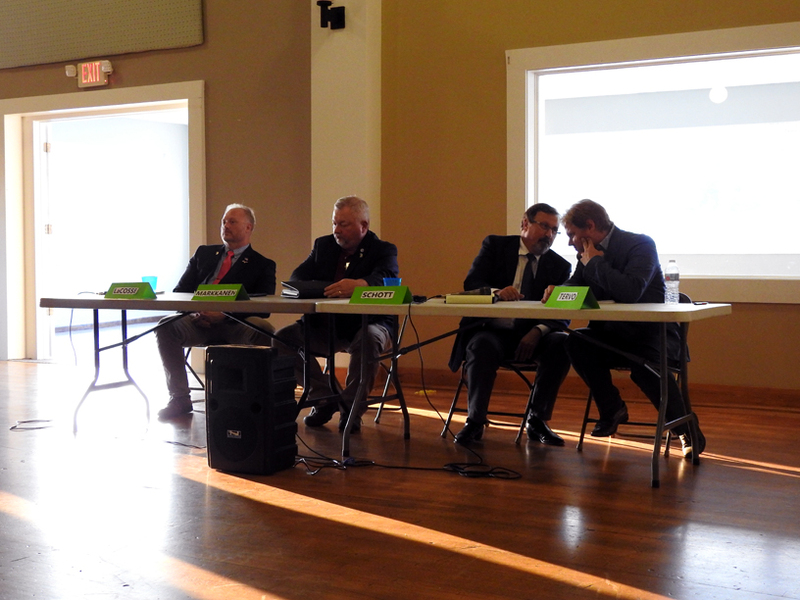 HOUGHTON — Energy, education and high auto insurance rates were among the topics at a panel for Republican candidates for the 110th District state House of Representatives seat. Participating Monday were Keith LaCosse of Powell Township, a former mayor of Negaunee; Greg Markkanen of Hancock, a teacher at Baraga High School; Kirk Schott of Bruce Crossing, an optometrist in Ewen and Baraga; and Brady Tervo of Chassell, sales representative for Auto Value of Houghton and Calumet. The seat is held by Democrat Scott Dianda of Calumet, who is term-limited. The Republican and Democratic nominees for November’s election will be decided in the Aug. 7 primary. On education, candidates backed the recent expansion of vocational education. Markkanen suggested working toward a two-track system in high school, with some studying the Michigan Merit Curriculum and others taking vocational classes. Schott, also a member of the Ewen-Trout Creek Schools Board, decried the “one size-fits-all” mentality, both in careers and in funding. 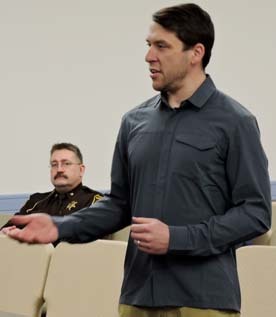 Tervo, a member of the Chassell Township Schools Board, cited the idea of state Senate candidate Ed McBroom to establish a student transportation fund. He also suggested adopting principles from Finland’s educational system: greater local control over funding and curriculum, as well as the value placed on teachers. LaCosse called to end Common Core and said parents should be more involved. He also said the state should reevaluate mandatory testing. Candidates offered strategies to make electricity cheaper. Schott said the Legislature should look at the Michigan Public Service Commission, which sets electricity rates. When it funds the creation of a new power generator or substation for a power company, it expects a 10 percent return, he said. LaCosse and Markkanen earned high marks from from the Michigan Conservative Energy Forum, which backs more renewable energy and energy efficiency. LaCosse wants the cap on solar electricity raised. Every dollar in renewable energy saves $3.55 in energy costs overall, Markkanen said. He called for alternative choices but said the state needs to look at the debate over the Renewable Energy Systems wind turbine project in Baraga County.